WASHINGTON, Sep 28 (IPS) - Six months into West Africa's Ebola crisis, the international community is finally heeding calls for substantial intervention in the region. On Sep. 16, U.S. President Barack Obama announced a multimillion-dollar U.S. response to the spreading contagion. The crisis, which began in March 2014, has killed over 2,600 people, an alarming figure that experts say will rise quickly if the disease is not contained. Obama's announcement comes on the heels of growing international impatience with what critics have called the U.S. government's "infuriatingly" slow response to the outbreak. 3After two infected American missionaries were administered Zmapp, a life-saving experimental drug, controversy exploded when reports emerged that Doctors Without Borders (MSF) had previously decided not to administer it to the Sierra Leonean doctor Sheik Umar Khan, who succumbed to Ebola after helping to lead the country's fight against the disease. The World Health Organisation (WHO) similarly refused to evacuate the prominent Sierra Leonean doctor Olivet Buck, who later died of the disease as well. The Pentagon provoked its own controversy when it announced plans to deploy a 22-million-dollar, 25-bed U.S. military field hospital—reportedly for foreign health workers only. According to the prominent political blog ‘Think Progress', this number represents "nearly two-thirds of AFRICOM's 4,800 assigned personnel" who will coordinate with civilian organisations to distribute supplies and construct up to 17 treatment centres. It's unclear whether any U.S. healthcare personnel will actually treat patients, but according to the White House, "the U.S. Government will help recruit and organise medical personnel to staff" the centres and "establish a site to train up to 500 health care providers per week." The latter begs the question of practicality: where would these would-be health workers be recruited from? According to the Obama administration, the package was requested directly by Liberian President Ellen Johnson Sirleaf. (Notably, Liberia was the only African nation to offer to host AFRICOM's headquarters in 2008, an offer AFRICOM declined and decided to set up in Germany instead). But in a country still recovering from decades of civil war, this move was not welcomed by all. "Every Liberian I speak with is having acute anxiety attacks," said Liberian writer Stephanie C. Horton. "We knew this was coming but the sense of mounting doom is emotional devastation." Few would oppose a robust U.S. response to the Ebola crisis, but the militarised nature of the White House plan comes in the context of a broader U.S.-led militarisation of the region. The soldiers in Liberia, after all, will not be the only American troops on the African continent. In the six years of AFRICOM's existence, the U.S. military has steadily and quietly been building its presence on the continent through drone bases and partnerships with local militaries. This is what's known as the "new normal": drone strikes, partnerships to train and equip African troops (including those with troubled human rights records), reconnaissance missions, and multinational training operations. To build PR for its military exercises, AFRICOM relies on soft-power tactics: vibrant social media pages, academic symposia, and humanitarian programming. But such militarised humanitarianism—such as building schools and hospitals and responding to disease outbreaks—also plays more strategic, practical purpose: it allows military personnel to train in new environments, gather local experience and tactical data, and build diplomatic relations with host countries and communities. TomDispatch's Nick Turse, one of the foremost reporters on the militarisation of Africa, noted that a recent report from the U.S. Department of Defense "found failures in planning, executing, tracking, and documenting such projects," leaving big questions about their efficacy. Perhaps more importantly, experts have warned that the provision of humanitarian assistance by uniformed soldiers could have dangerous, destabilising effects, especially in countries with long histories of civil conflict, such as Liberia and Sierra Leone. At the outset of the crisis, for example, efforts by Liberian troops to forcefully quarantine the residents of West Point, a community in the capital of Monrovia, led to deadly clashes. Some public health advocates worry that the presence of armed troops could provoke similar incidents. 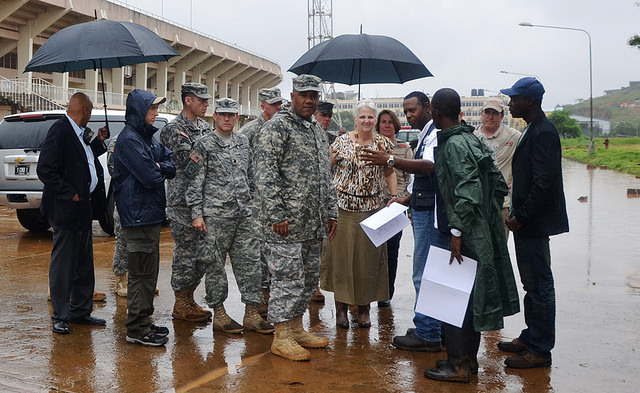 The U.S. operation in Liberia warrants many questions. Will military contractors be used in the construction of facilities and execution of programmes? Will the U.S.-built treatment centers be temporary or permanent? Will the treatment centers double as research labs? What is the timeline for exiting the country? And perhaps most significantly for the long term, will the Liberian operation base serve as a staging ground for non-Ebola related military operations? The use of the U.S. military in this operation should raise red flags for the American public as well. After all, if the military truly is the governmental institution best equipped to handle this outbreak, it speaks worlds about the neglect of civilian programmes at home as well as abroad. This article first appeared on Foreign Policy in Focus. You can read the original version here.